The M1919 Browning is a .30 caliber medium machine gun that was widely used during the 20th century. It was used as a light infantry, coaxial, mounted, aircraft, and anti-aircraft machine gun by the U.S. and many other countries, especially during World War II, the Korean War, and the Vietnam War. Although it began to be superseded by newer designs in the later half of the century (such as by the M60 machine gun), it remained in use in many North Atlantic Treaty Organization (NATO) countries and elsewhere for much longer. 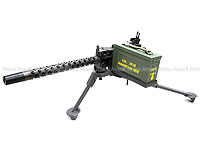 It is very similar in design to the larger .50 in (12.7 mm) M2 Machine Gun, which is also a Browning-designed weapon and is still in NATO service. Viva Arms produces this excellent Airsoft replica made from steel and aluminum. The M1919 Browning Machine Gun comes with an M2 style Tripod made from Steel. Uses a Version 7 M14 style gearbox that can be easily upgraded with numerous parts on the markket for higher power and rate of fire. Large battery compartment has room to house a 12v NiMH battery if needed for high power or high rate of fire upgrades. Limited to 300 pieces worldwide! So get one while you can or you will regret it! At this price it's a bargain!